Very nice! You've reminded me I should get on and make something for my mum too. I'd take Flea Market Fancy if I won, it's so pretty and springlike. Great apron coverage for a jam maker! I'd love one of the Madhuri range, but so many gorgeous fabrics to chose from. Flea Market Fancy love this one. What a fantastic idea for a Mothers Day gift, my Mum would adore a hand made apron. The fabric for the apron would have to be Bake Recipes in Blue, it's pretty & practical! I would choose the Wildwood Forest print to make a little frilly apron for my friend's curious, and. inevitably messy, toddler! Lovely apron! I would choose Heirloom in Jade. So pretty. The apron is stunning! I'd chose flea market fancy bequest in grey. I would choose Petite Street House - so cute. We celebrate Mother's Day in August here (it's even just an Antwerp thing, as far as I know) so I still have some time! I'd choose the Wildwood fox fabric, because FOXES! After browsing all the beautiful fabrics I think I like the Alchemy Flora Aqua best. I like the flea market fancy in red - the orange background is lovely and I have some of this range of fabric already - it's so pretty. There are lots of great fabric, but I think I would choose Petite Street - House - it would make a nice fabric shopping bag. Ooh! I'd love Flea Market Fancy Bouquet in Grey. Your apron looks both lovely and very functional :) I make jam too, so I know full coverage is a necessity! Thanks so much for the giveaway! I'm partial to half aprons myself; but this is a lovely apron! I immediately fell in love with "Enchanted Forest Snail Cream." Quirky and cute and includes my love of purple, grey and teal! Beautiful apron! I'd love to win the Enchanted Forest Snail in cream - such a fun pattern! beautiful apron fab job love it!!! i would love to win the enchanted forest snail in cream would be ideal!!! Oooo I love the Chinese Lanterns! FLY A KITE STRAWBERRY STRIPE - PINK :) love it! I love the geekly TV Aqua. This is a beautiful make! I'd choose Love & Joy Cheery- Aqua if I won, oohhh and how I'd love to win! That's really, really cute! What a great gift! I love your dining room, too- how pretty! I love the Peacock Feathers Blush - ticks all my colour boxes! I would love the Evening Blooms Main - Yellow! It could look great covering the throw pillows in my living room. Fun apron! I just made myself one in a fun cat fabric. I went for full coverage too. Lovely fabric! A pretty apron always cheers up the kitchen! I love the flea market fancy bouquet in grey (and looking at the name, it now makes perfect sense why!). :) Thanks for the chance to win! Love the apron, I think any mum would love to receive it as a gift. I'm also loving Wildwood Forest - Teal. What a sweet gift, and a lovely giveaway. I like 'Chinese Lanterns- Grass' and would be very tempted to steal your style a little and make a vintage peter pan collared sleeveless top with it. I would choose the Butterfly Chinz. It is gorgeous. I love your apron although I agree you need to make another for your mum in law and keep that one... it ties in with your polka dot chinaware!!! How completely awesome is that!?! Same fabric only the green version would be great in my kitchen...hmm..I feel a new project, only for me this time. Ooh, thank you for the lovely giveaway! The apron looks fabulous. It was hard to choose one favourite from the Purple Stitches website, but I think Petite Street - Flower is the winner :). I would love campervan blue - just perfect for me! I would go Wildwood Fox in cream...it's some foxy looking fabric! I think I'd use it to make some shorts for summer...I really want it to be summer again please! I'd love bake recipe blue -it would make a fab apron. This fabric is so cute! Adorable! Hollyfield Red and Blue. My fav. Petite Street Flower please .. for my first tunic dress for my little one, Thankyou. Beautiful fabric! I really like the Enchanted Forest Snail in cream. So pretty! Ooh, lovely! I've been meaning to make an apron for ages and never got round to it. I think an apron would be really cute in the Funbot - Summer fabric. :) Thanks for the giveaway! Great apron Jane and lucky MiL. 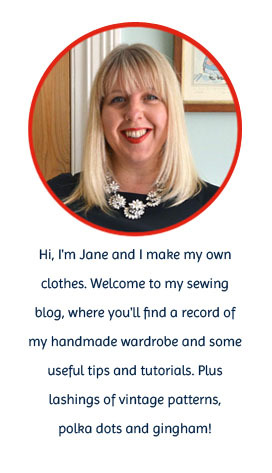 I hadn't heard of Purple Stitches before and it's always good to learn about another online fabric shop! I'd choose Sasparilla Bandana - Teal. Ooh I think Dashwood Studio's Wildwood Mushroom in Purple is v lovely, I'd take that! I love how the apron goes with your polka dot dishes ) Great job! 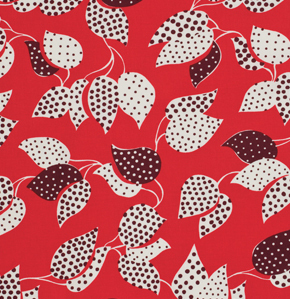 I'd love to make something for my daughter with the Petite Street - Clouds fabric, it's beautiful! I think I would choose Remix - Summer. I love the 'Stamp' print in purple & orange (Prestigious Textiles) - would make a beautiful quirky skirt. I'm not putting my name down for the giveaway, but wanted to say what a lovely apron that is! Your apron turned out so cute.. Know your mil will love it. If I won, I would like the Little Red Riding Hood -Red.. So cute. I love the 'Fly a Kite' design - I'd like to make an apron for my little lady and a matching one for her teddy. Such a cute apron! I keep meaning to make myself one before getting distracted! But if I were to make one, it'd be with the sasparilla bandana in teal... that print makes my heart sing! Petite street flower - this is lovely! Your apron is rather fab too! Somehow that apron just looks like jam! It's perfect! What a lovely gift. If I should be so lucky; Avignon Vines- Cream. Boys chevron blue... So beautiful!!! The apron is lovely - good coverage for all that jam! I would choose geekly mustache and make something for my 15 yr old son. he always complains that I never make him anything (but then can't actually name anything sensible he wants). I'd pick Evening Blooms Floral - White as I fancy making a monochrome quilt. Oh wow, what an amazing collection! I have fallen for Love and Joy Bird Green. So sweet, and such an intense grassy colour, it really appeals to me! Chinese Lanterns- Grass is fantastic! Bake bowls pink for me! I would choose Campervan - Pink. It is absolutely wonderful! I would go for the Petite Street - House, so cute! I would go for Little Mushroom in white. I know I'm an adult (supposedly) but I'd love a dress out of it. Or, how about making bias tape with it, so that the inside of all my garments would be cute as a button, er, mushroom? Oh this is such a good idea for mothers day! thanks for the thought. I would either go for the flea market bouquet in grey or the bake recipies in blue - perfect for an apron! boys chevron blue! I love it! it my birthday and mothersday in the same week and my 4 year old keeps asking if she can have presents as well. I would make her and my 5 month old a simple pretty dress I think this fabric would look stunning (also have my eye on another 6 just for dresses for the girls haha) your apron looks great you should make one for yourself too the colour really suits you. That is a glam apron! I've just taken up sewing again after a long break so it's baby steps but I'd love to do something with the Wildwood Trees multi fabric. I would choose Wildwood Fox. Thank you. OMG have you seen this fabric http://www.purple-stitches.com/products/geekly-tv-aqua.html AWESOME! I want to make a skirt from it! Lovely fabric, hard choice! But the Love and Joy Daisy - Green will match my room perfectly!! Lovely apron - not surprised you want to keep it! Lots of pretty fabrics to choose from, but I think my favourite is Petite Street Clouds. Thanks for the giveaway! Thanks so much for the giveaway! The fabrics are all so lovely--I think I like the Cypress Paisley - Blush the best! Goodness! I had a hard time picking just one fabric that I'd love to get! But I think the one that stood out to me most was the Enchanted Forest Snail! I have a few ideas in mind that would be really cute out of this fabric, but I think one would be a drink cozy or a tote bag! Evening Blooms main - yellow I'm trying to brighten up my daughters bedroom, we're renting so its the classic rental magnolia everywhere! Trees and Squirrels is wonderful! Really pretty fabrics - I'd like Little Kukla - shame my work seems to think the website contains "adult material" and won't let me take a proper look round! So many to choose from! It'd have to be Kashbah - Midnight though - it's gorgeous! Oooh, there are some lovely fabrics to choose from. Spoilt for choice! Petite Street in grey is my favourite. And I do like your apron...! I would choose the Heirloom in Jade - gorgeous! I would choose Love & Joy Bird - Pink - It's so cute and would make something lovely for my daughter's bedroom.